We've been covering the SteamOS and Steam Box since day one of its announcement, and it looks like we're finally going to see some real products at this year's Consumer Electronics Show. First up is iBUYPOWER and their SBX Steam machine (shown above). In what I'm predicting will be the primary method of deployment for the Steam Machine, the SBX is an ultra-simplified system that looks the part as a game console, but harnesses the power available from your desktop PC. For more information, check out press release at the bottom of this post. Also check back with Futurelooks as we will be checking out the iBUYPOWER system personally. ZOTAC is taking a different approach with their Steam Machine. The upcoming ZBOX Steam Machine mini-PC is what anyone who has worked in enterprise IT would call a thin client, or at least it looks that way on first blush. While this may look like a VESA mountable low power system, Carsten Berger, senior director, ZOTAC International assured us that "gamers can expect the latest Intel Core processor and NVIDIA GeForce GTX graphics processor in the upcoming ZOTAC ZBOX Steam Machine for stunning visuals and world-class features." Details are of course pretty light, but you can check out the press release below. We're very interested in these first Steam Machines so definitely check back in the days to come. These definitely won't be the only Steam Boxes to be announced the week of CES 2014. January 6, 2014, 6:00 PM PST, Las Vegas, NV -There are very few instances where one product category can leap frog over to another and make a profound impact. Today, iBUYPOWER, together with Valve, is making one such leap. Introducing the iBUYPOWER SBX Steam machine, an ultra-simplified system designed to do one thing: entertain. Melding together the simplicity of a traditional game console, but harnessing power usually available to only high-end desktop PCs, iBUYPOWER is able to usher in both performance and content unheard of in the living room space. For more information, please see http://www.ibuypower.com/Product/SBXDesigned in Los Angeles, iBUYPOWER labored to create a highly tuned and optimized system that would deliver a sustainable 60 frames-per second gaming experience at true high-definition resolutions. Powered by multi-core processors in both AMD and Intel flavors and paired with the latest in graphics technology from AMD, customers will be able to jump a full generation ahead of the latest game consoles. Customers can expect an out-of-box experience unlike any other. Every iBUYPOWER SBX comes with a Steam Controller so customers can jump into the action immediately. All aspects of design and hardware are optimized for a gaming experience on Steam OS that sheds away legacy PC overhead. Make no mistake about it; this is not a PC. iBUYPOWER’s Steambox will be available later in 2014 and will ship with a Steam controller for $499 and will be available in matte black and white. HONG KONG - Jan. 6, 2014 - ZOTAC International, a global innovator and manufacturer of graphics cards, mainboards and mini-PCs, today previews the upcoming ZBOX Steam Machine mini-PC with Steam OS at The Consumer Electronics Show 2014 in Las Vegas, Nev. The ZOTAC ZBOX Steam Machine is engineered from the ground up for breathtaking gaming performance in a compact mini-PC form factor that’s a fraction the size of traditional mini-ITX based gaming systems. "ZOTAC is pleased to work with Valve Software to create the ZBOX Steam Machine. Valve’s SteamOS is a game-changer to the PC gaming market that enables us to deliver a game console experience that’s superior to the latest next-generation console,” said Carsten Berger, senior director, ZOTAC International. “Gamers can expect the latest Intel Core processor and NVIDIA GeForce GTX graphics processor in the upcoming ZOTAC ZBOX Steam Machine for stunning visuals and world-class features." The ZOTAC ZBOX Steam Machine will feature an enthusiast-class Intel Core processor that delivers class-leading performance with excellent energy-efficiency. Graphics power for the ZOTAC ZBOX Steam Machine will come from an upcoming performance-class NVIDIA GeForce GTX graphics processor for an outstanding smoothness and superior features. Exterior enhancements to the ZOTAC ZBOX Steam Machine include an all-black 3rd Generation ZBOX chassis with orange lighting that gives the mini-PC aggressive and sporting aesthetics. 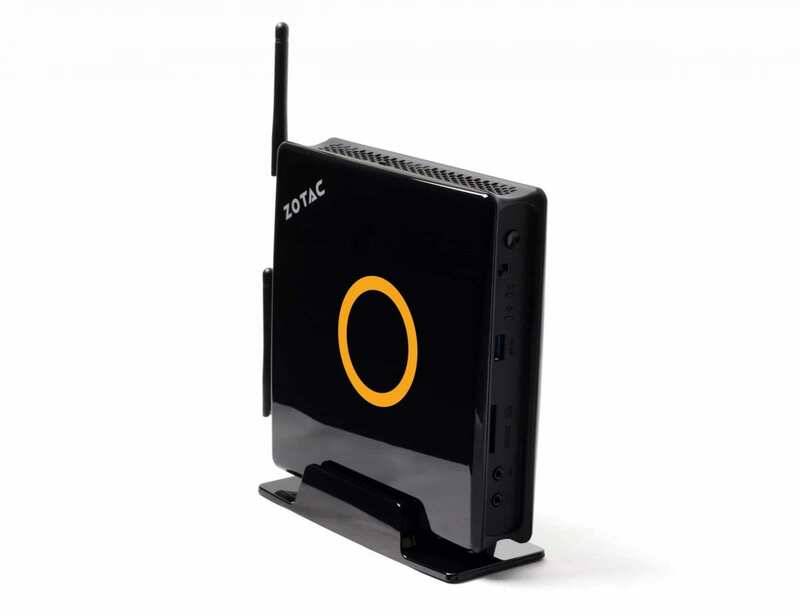 The ZOTAC ZBOX Steam Machine will ship with SteamOS preinstalled and include the Steam Controller. Expect the ZOTAC ZBOX Steam Machine to reach retailers in the second half of 2014. More details will be released closer to the launch date.